Although Gap's recent campaign has emphasized normcore, I didn't give it much thought. As evidenced in this blog, I fancy bold colors and eclectic patterns just as much dressing simply. The notion of "dressing normal" just sounded counter to my instincts. Yet, as history has taught me, I'm not one to ever say "never say never" (anymore) and here I am…looking quite "average." 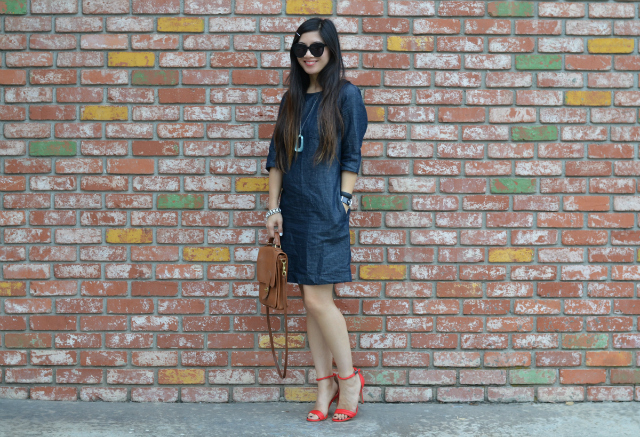 A simple dress with heels. Nothing more. Nothing less. It is what it is. It's actually refreshing if you think about "dressing normal." Throwing on the basics and looking just as put together as the other more ostentatious outfits is awesome. It's even liberating to know that I feel just as good without all the "extras." But, don't think this one look will stop my eclectic style vibe. After all, I am who I am. Really cute dress .. I love how it's just a clean lines type of dress .. looks classic! Gorgeous! 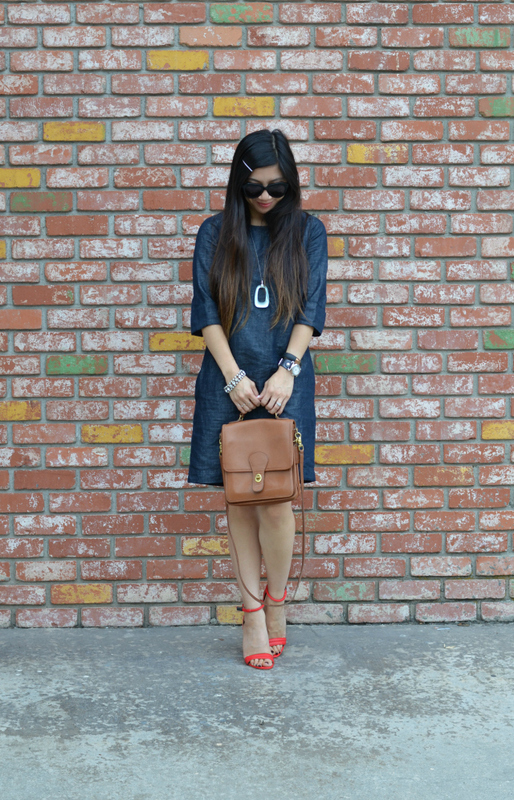 I love the denim dress and the pop of red looks great! What a cute dress! 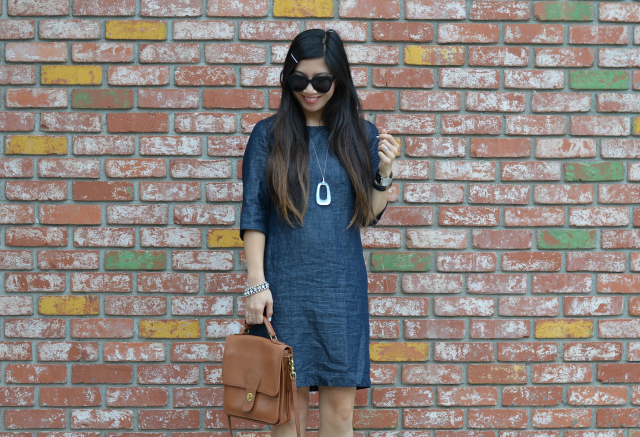 Dressing simply is very refreshing—I definitely love my basics! I like that you kept with your style by adding a bold shoe and necklace. You look great! Honestly, I don't understand normcore. It's okay if someone's style is minimalist, but to me normcore just seems boring. I'm with you on bold colors and prints and having fun with my style! 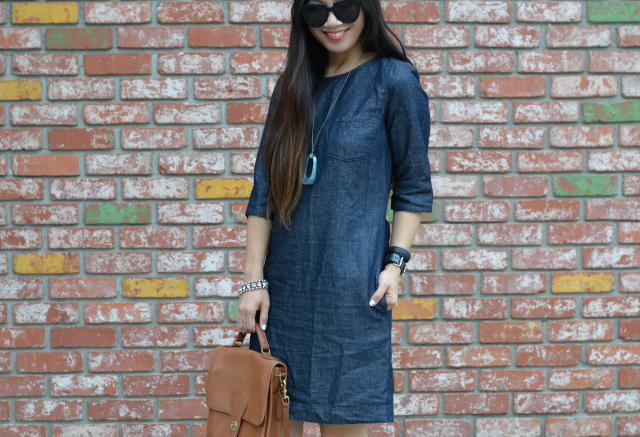 This denim dress is really cute! I love the minimalist look! The play with colors in your heels makes this outfit not so normal and adds the effortless chic you always have. Love the pop of color with the heels! And that bag is perfect! I love this dress on you along with those bright heels. I love that it has pockets. Well, you look good in a "normal" outfit! haha... Love the dress! Oh my your outfit is so adorable. I love that your dress has pockets. Oh my gosh this look is too cute! love love the dress and the red shoes! Ok, I beg to differ, I see "normal" as average. There is nothing average about you. I do love this simple dress, but I love that you added orange sandals and a bold pendant necklace. This is not an average or normal outfit, face it, you special to be merely normal. Love that you thrifted that gorgeous bag! Love the pairing of the bright shoes! That dress looks awesome on you Nancy! Your accessories make it so you! Looks great! i like how you paired the dress with those colorful heels and that beautiful necklace!